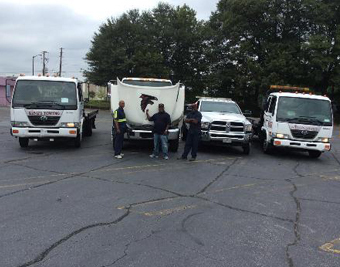 Heavy Duty Towing in Atalnta King's Towing Atlanta GA are experts in heavy duty towing. Anyone with a heavy vehicle like a truck, large 4X4, large pick-up-van, and building machinery know that when they need a tow, you really need to call an expert who knows how to handle such a heavy vehicle. King's Towing Atlanta GA has specially trained staff to deal with towing heavy machinery and heavy vehicles. We also have a range of tow truck to send to your location that can deal with any towing issue you may have. Our staff are aware of the dangers and pitfalls of towing heavy vehicles and take the utmost car when attaching your vehicle to our special tow trucks and ensuring that all goes smoothly.